Know what happened on September 4, 1998? 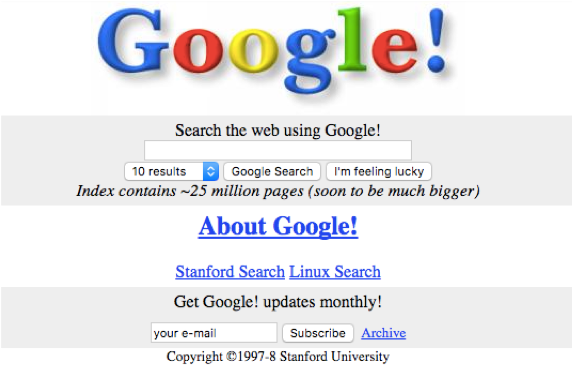 It was the day Google was born. Legend has it that one of the earliest searches typed in Google was for the name “Gerhard Casper.” Previous searches of this name on AltaVista, the premier search engine before Google returned web pages for Casper the Friendly Ghost. But in 1998, Google got it right. Its search result returned Gerhard Casper, President of Stanford University. Looking at these images, it’s easy to see how things have changed. Entire industries in web design (thank goodness), SEO, demand generation, and digital content marketing now thrive, but these images represent their most humble beginnings. The Gerhard Casper example is perhaps the earliest we have of SEO. 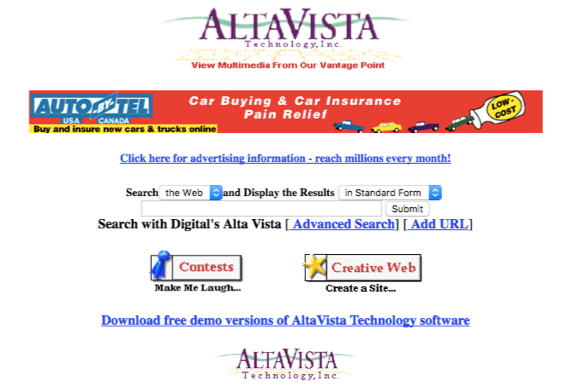 While this particular example speaks to the power of Google over AltaVista, it also reminds us that we want to be found. If I type in the name of your business in a search engine, you want it to be ranked first. 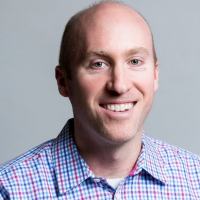 You don’t want to be outranked by a reference to Casper the Friendly Ghost, or a competitor. And so, search engine optimization was born. Moz was founded in 2004 by Rand Fishkin, the self-proclaimed Wizard of Moz, and Gillian Muessig. It’s a tremendous resource and their team does a solid job of helping SEO junkies and newbies alike navigate shifting algorithms and best practices. Organic search engine results: Organic here means au naturale. These are results that show up without being incentivized by payment. They’re free. They’re coming to visit because they really like you and what you’re doing. But, even though they’re free, organic search engine results still bear a striking resemblance to organic avocados at Whole Foods. Both require an investment of time and dedication to get it right. So, how does content marketing fit into all of this? In case you’re not sure, it’s okay, many people are challenged by what exactly content marketing does. The goal of content marketing is to educate, engage (not sell), and create brand awareness by providing value to digital audiences. Content marketing is key to organic SEO. It’s what makes SEO tick. It is valuable and engaging content that drives organic traffic. Moz recently published an article, the SEO Checklist: How to Rank in 2018, which shared a list of insights that should help just about anyone to have a working understanding of the SEO game. We believe that these insights, married with content marketing efforts, will cause your SEO rankings to soar. Follow these guidelines, and you’ll have more traffic than you’ll know what to do with, but that’s a good problem to have, and we’re confident you’ll figure it out. Google scans the web via what are commonly called Googlebot spiders. These little bots are programmed to look for the good stuff, so they know what gets pushed to the top of the rankings and what gets ignored. Your website’s content is what differentiates you from competitors. Bring your site to life by using a suite of fresh and rotating content assets like blog posts, video, images and FAQs. This is what makes your site more appealing and relevant to those spiders. Pro tip: You can also give your site a boost by writing the right copy in your meta tag title and description. Get a good writer to craft a concise message that tells your story. Keywords are the words people type into search engines to find something. It is important for business owners to know what keywords potential customers are using to discover products and services. Business owners and marketers can then aim to rank for those keywords. There are a few ways you can find out the keywords people are using to find you. The easiest way is to listen to your audience. What do they say? What do they click on? What are they excited about on social media? One option is to use Google Trends, a free tool, to see how keywords rank and compare. You can see that content marketing is the clear winner, so in this instance, that’s the keyword to aim for. Of course, you can add whatever terms you like, and you get to customize your search by industry and time period to get a sense for seasonality. The results show which website content will drive the most traffic to your site. If you are a plumber and sump pumps are ranking high, then by golly, serve up some site content on sump pumps! Use keyword ranking as a way to let your writing team know what to write about. Be strategic by using the plethora of free data available to you. The search engine results page (SERP) is what is displayed based on the query entered into the search engine. You want to be on that first page of results, so pay attention! Do some testing by searching for things your audience might enjoy. Is your business ranking? Is something entirely irrelevant ranking? This is your roadmap to content creation success. Discover what’s missing and how you can drive traffic. If you’ve done your homework and know your audience, you know what they need. Fill the SERP gaps with quality content to help boost your rankings. Write quality, educational content that adds value to your reader’s lives. If you can have someone who’s already an authority on the subject, get him or her to write and publish the article. Their potential social media and backlinking influence will help amplify your message in a more authoritative way. You’ll get more Google-love if your content is shared by others around the web and if your bounce rates are low. It may not be easy at first to identify these influencer or micro-influencer types, but building partnerships with them is a great way to help your audience get what they need while driving more quality to your site. What Do I Really Need to Know About SEO? SEO is intimately tied to content marketing. It’s a simple formula: quality content marketing yields higher search rankings. 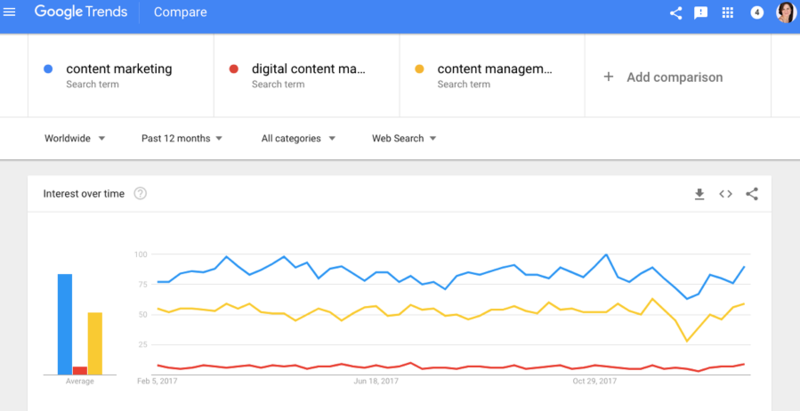 There are frequent search algorithm changes and new best practices to follow each year, but the bottom line is that authentic, valuable content always wins. Educational content that delivers what your audience wants is what cuts through the SEO noise and consistently drives results. Are there any important SEO tactics you’d add? Tell me about them in the comments.